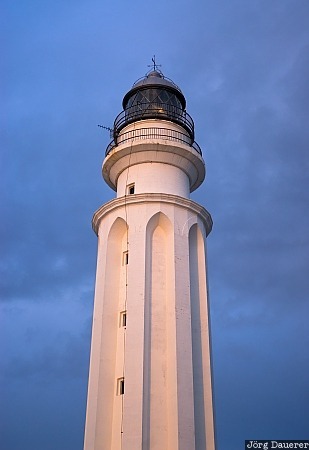 The lighthouse at Cabo de Trafalgar illuminated by warm late evening light. Cabo de Trafalgar is at the Atlantic coast of Andalucia, southern Spain. This photo was taken in the evening of a sunny day in April of 2008. This photo is part of the exhibition Lighthouses (February 2010). This photo was taken with a digital camera.